I'm so pleased to be taking part in The Artery Literary Saloon this coming Thursday, December 10 at 7:00PM with Ted Bishop, Greg Hollingshead, Lynn Coady, and Marina Endicott. 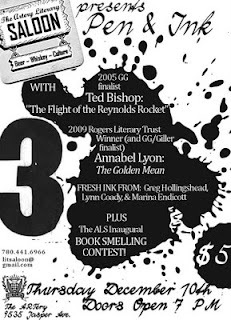 They're also promising something called the ALS Inaugural Book Smelling Contest. Come to the Artery, 9535 Jasper Avenue, Edmonton to learn more.